Texworld USA: Fashion Mingle Participates in THE Sourcing Event of the East Coast! 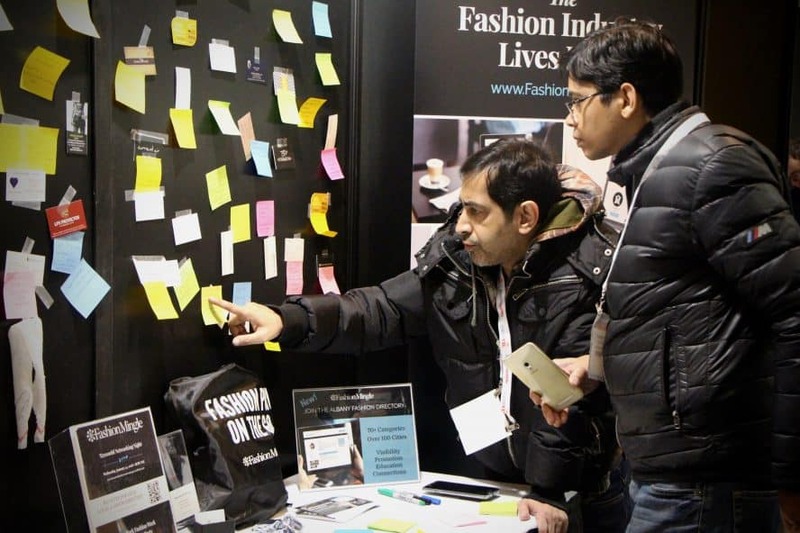 Fashion Mingle spent several productive days on ReSource Row at Texworld USA + Apparel Sourcing USA in New York City January 22-24. It was great to meet and learn from a variety of apparel fabric buyers, product R&D specialists, designers, merchandisers and sourcing professionals. The enthusiasm for Fashion Mingle was exciting to hear! A popular component of our booth was an I’m Looking For post-it board in which visitors could write down the skills or services they were in search of. It was satisfying to see connections being made, with people snapping pics of potential collaborations. Missed us at Texworld? Don’t worry, the Fashion Mingle platform has the I’m Looking For feature as well! Sign up here. As a result of our participation we had many new members register for our community, primarily in the production category for small batch manufacturing, and USA and international garment and textile manufacturing. Fashion Mingle also hosted a Texworld Fashion Industry Networking Night in the evening at ROW NYC. It was fun to continue conversations in a relaxed atmosphere, with our famous Mingle Martini in hand of course! We hope to see you this summer July 23-25 at the next 2018 Texworld trade show.